Wings For Life World Run 2018 | JustRunLah! The Wings for Life World Run is a truly unique and global race for both runners and wheelchair participants. Instead of a finish line, competitors race side by side to keep ahead of the virtual Catcher Car. 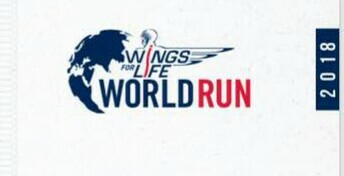 Now in it’s fith year, on May 6, 2018 Wings for Life World Run participants in Malaysia can also run together in Kuala Lumpur. Meet up with your friends, download the Wings for Life World Run App and join all the other people running until the virtual Catcher Car catches you of course. The race starts at exactly 19:00. The virtual Catcher Car takes off 30 minutes after the start at 15km/h and steadily increases its speed until the last athletes have been caught. 100% of all donations and the entry fees go directly into spinal cord research projects.